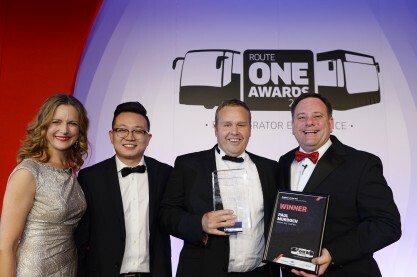 We are very pleased to announce that at the recent routeone Awards our Director of Engineering, Paul Murdoch, beat off stiff competition to take home the award for Engineer of the Year. The routeone Awards are for those who have been judged the best in the coach and bus industry and Paul is the only person to have been awarded this special accolade three times. Paul was nominated earlier this year and after making the shortlist of just five candidates, he faced a tough interview process from a panel of industry experts. From everyone here at Golden Boy Coaches we would like to thank Paul for all his hard work and who knows maybe a fourth award is in the pipeline?